President Goodluck Jonathan faces a tough battle again a potential APC candidate and a presidential run-off is a distinct possibility. In order to win the Presidency in 2015, the successful party will have to control the majority of Nigeria’s 36 state Governorships. In the 2015 elections half of the State Governors will have completed their maximum two terms, so state-level elections are likely to be extremely competitive across the country. Of the 28 governorship elections taking place, 18 states (or two-thirds) will have vacant seats. 10 of these 18 states have 40.9% of all registered voters. This numerical analysis indicates both the PDP and APC could each secure 17 states in Governorship elections. To win, a Presidential candidate needs an overall majority and at least 25% of the votes in two-thirds of the states (24 states). On current indications, if President Goodluck Jonathan runs as PDP candidate he is likely to get an overall majority. However, he may not automatically get the necessary one-quarter of the vote in two-thirds of states and the FCT. Therefore if voting patterns are similar to 2011 a run-off election situation would be likely. This would be a historic first under Nigeria’s present electoral system. However, this run-off outcome is likely to be determined by the choice of candidates put up by the main APC opposition party and the issue of North-South “˜zoning’. It is difficult to predict the outcome of this run-off. If it does not favour an outright win for the PDP, it may further weaken its chances at the subsequent gubernatorial elections given that half of the seats are vacant. 2011’s results are only a useful guide to 2015 if conditions stay the same, including INEC’s conduct in voter registration and election management. Therefore, with high incentives for many actors to rig, it will be important for stakeholders in democratic consolidation to focus on issues such as registration and collation, which are likely to be hot in all states. As the 2015 elections inch nearer, the spaces of Nigerian public discourse are beginning to fill with speculation as to the chances of various contenders, the possible alignments of political forces, and likely outcomes. Yet most of this discussion is conjectural and instinctive rather than analytical. Here, we attempt instead to make some projections about 2015’s elections by generating conclusions from 2011’s election results, turnouts and voter numbers. Our central assumption is that since 1999, the parties which have controlled Nigeria’s 36 state Governorships have been able to strongly influence the result of Presidential elections in each state. In 2011, President Goodluck Jonathan won the election with 22,495,187 total votes across the country, winning not only states where the ruling PDP governed, but also all states in the South-West apart from Osun, thanks to an electoral pact between the PDP and the now-defunct ACN which ran most South-Western states. Although President Jonathan did not win in 12 Northern states (including nine which returned PDP Governors but where a majority voted for Muhammadu Buhari of the now-defunct CPC for President), he was able to get over the 25% of votes threshold in all but four (all Northern) states; of which only two were PDP. This indicates that local voter appeal can be an important modifier of the power of incumbency. But in 2015, the landscape appears very different. As control of the 36 states and Federal Capital Territory (Abuja) are key to how national elections are won, we must first examine the state-level elections. 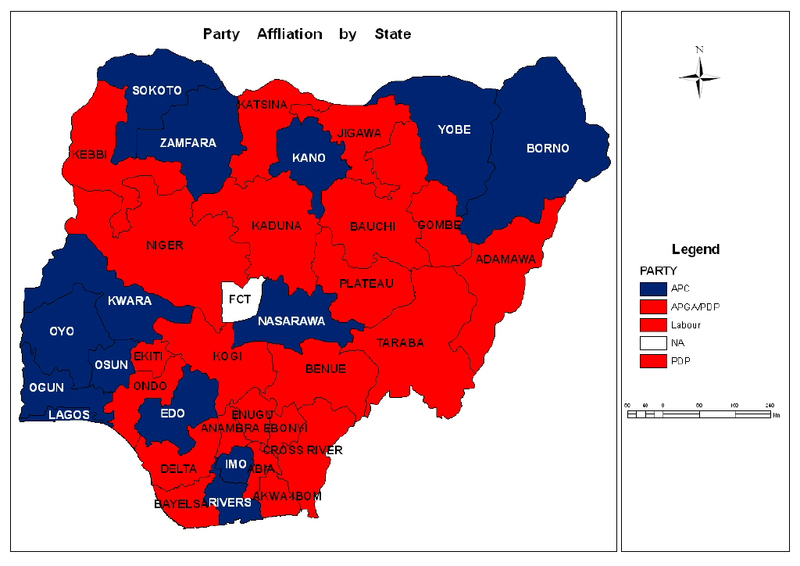 In 2011, one of the authors analysed gubernatorial election results (as posted by Nigeria Elections Coalition). Nigeria’s elections conform to a rule of thumb, (as propounded by political scientists such as Nic Cheeseman) about elections in Africa and more widely: when incumbents run for re-election, they win over 85% of the time and typically with over 60% of the vote – in 2011, 17 of Nigeria’s 20 then-incumbent State Governors were re-elected – exactly 85%, with an average winning vote of 69%. 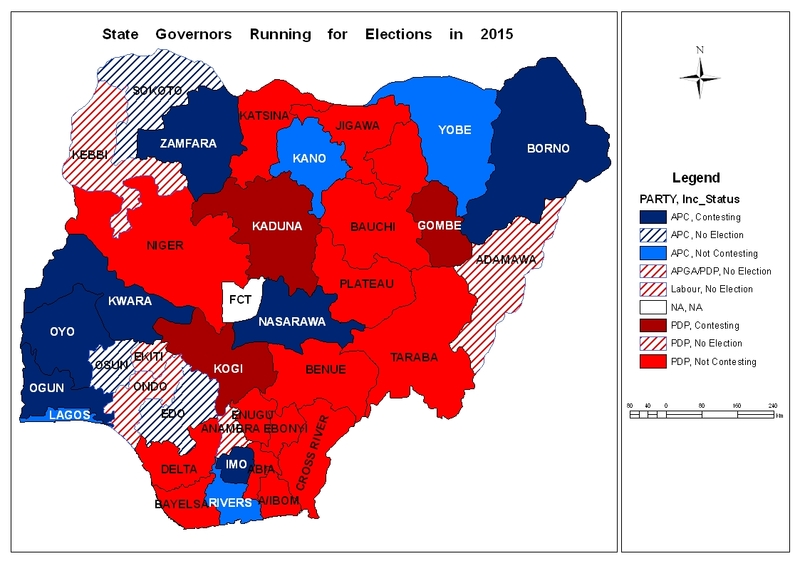 Although based on a small sample, this margin of victory was similar whether the winning Governor was from the national ruling PDP or another party, suggesting that state-level incumbency might be more important than being part of a national ruling party. Any candidate contesting for a “˜vacant’ Governorship is more likely to win, and by a larger margin, if they are from the same party as the previous incumbent. (See calculations below). As well as pointing to the importance of incumbency, and the role of constitutional mechanisms such as term limits in maintaining democracy, these results also offer a way to predicting possible outcomes the 2015 polls. In what follows, we explore what the figures may tell us. We are aware of two weaknesses in our methodology. One is the small size of the data sample – drawn from just one previous national election under the same conditions. The other is our assumptions – for 2011’s data to have predictive value, a number of conditions must remain the same; we debate whether or not they are likely to in the section on “˜assumptions’. The first thing to note is that the alignment of political forces today is very different to 2011. Whereas the PDP went into the 2011 elections controlling 27 state governments, currently it controls 20 and can rely on the likely support of two more Governors, from Ondo (Labour) and Anambra (APGA), making 22 in total. The APC opposition meanwhile controls 14 states, as illustrated below. This is a rapidly changing dynamic however, as alliances continue to be built and reconfigured. Secondly, 20 Governors entered the 2011 elections in the strong position of first-term incumbents looking to come back; but in 2015, only 10 of 28 Gubernatorial incumbents will be re-contesting – 7 for APC and 3 for PDP. The other 18 races will be “˜open’ with no incumbent, while 8 states where elections are held at different times will not be holding Governorship polls. This means more elections will be competitive, with fewer places where an incumbent Governor can be sure to “˜deliver’ a state’s vote for their Presidential candidate. This makes results even less predictable, but as 2011 shows – even outgoing parties without an incumbent re-contesting retain a marginal advantage. We can therefore assume that states which have been run by a particular party will still be more likely to support that party’s Presidential candidate. There will be elections in 2015: We work on the assumption that any attempt to delay these could lead to a major constitutional crisis and radically alter political alignments. It is possible that the Independent National Electoral Commission (INEC) could choose not to hold elections in states where the security situation prevents it; they are legally entitled to do so. Currently, three states (Borno, Yobe and Adamawa) in the North-East are under State of Emergency, although Yobe’s successful by-elections show that elections are not necessarily impossible under such conditions. Still, if elections were not held, it would not alter the conditions which we note as likely to lead to a Presidential run-off. INEC’s commitment to running free and fair elections will remain the same, although the electoral commission remains restricted in some aspects of capacity and control, and local-level implementation varies. Recent trends such as decisions not to use electronic voting machines in Ekiti and Osun elections may cast doubt on this. Overall, INEC’s management of state elections has improved since Anambra in December 2013, but it remains to be seen if INEC can scale up the achievement to a national exercise. Improvements made in 2011 will remain and restrict rigging to the post-collation process: Whereas 2007’s poorly-run election allowed votes to be completely fabricated, registration and accreditation has since been tightened, so that the main avenues for rigging are more restricted to the use of actual voters, or at least their cards. This might mean renewed attempts to register voters fraudulently in order to increase numbers, but the only other avenue for outright rigging would be post-poll collation at local levels, which should therefore be a focus for observer groups. 2015 will be an overwhelmingly two-party race between the PDP and the APC in the Presidential elections: this currently seems self-evident, and the APGA and Labour parties are likely to support PDP. Presidential polls will take place before Governorship elections: as on previous occasions, this means that incumbent governors are influential in controlling the presidential vote. If the order were reversed, the rule may not hold true. The PDP candidate will be President Goodluck Jonathan, whereas the APC would likely select a Northern Muslim candidate: This is a fundamental assumption, and we can question whether voting patterns would still cleave to 2011’s alignments if the APC candidate was for instance from the South-West, or was a Northern Christian. Equally, there is the more remote possibility that the PDP may choose a different Presidential candidate. Election security management will reflect that of 2011, in which security agencies were widely acknowledged to have improved their practices: Many new security challenges have evolved since 2011 but if the agencies can stick to their record of improvement, the environment may remain predictable. If not, or if attempted disruptions overwhelm them, the outcomes will be much less clear. Turnouts are crucial but hard to predict. If a voter register is realistic, party mobilisation and levels of public interest in the candidates dictate the turnout. Anambra’s 2013 election, with a 25% voter turnout, offers a stark indicator of what happens when they are disinterested. Reports by civil society observers were that large numbers of residents stayed at home, or even sold their voter cards before election. Such low turnouts can favour riggers, as they allow lots of unused votes to be creatively redistributed, in front of a largely apathetic public which may not enthusiastically defend its mandate. And, as we have seen, incumbents have a greater ability to rig due to their control of resources and the environment. As PDP are incumbent in more states, this might at first glance seem to favour that party more, but as there are a number of states in which the party may struggle to clear the 25% margin, low turnouts are a big risk for PDP too. Money is hugely important in politics, but is of limited use without genuine support. Paid-for support is expensive and unreliable, while dedicated support is more consistent (and cheaper). While incumbents may have more to spend, they may not necessarily have more to offer in mobilising voter enthusiasm. Historically, parties’ appeal to voters has been based on ethno-regional or faith identities, although the 1999 and 2007 elections broke a mould with three major parties (the PDP, ANPP and AD/ACN) all picking Southern Christian and later, Northern Muslim Presidential candidates respectively. For 2015, parties have so far made little effort to formulate policy messages, and membership structures vary from very weak to strong between parties across the country. While the PDP has struggled to convince the electorate of its ability to deliver on key issues such as poverty reduction, security or combatting corruption, the APC’s positioning as a more progressive party has been watered-down by the large number of floor-crossers the party has incorporated and its tactic of negative campaigning has also alienated some potential supporters. It will be interesting to see to what extent both parties are willing or able to mobilise voters with policy messages rather than simply appeals to identity politics. The current political alignment of state government is as follows. Note that APGA and Labour Party states have tended to ally with the ruling PDP party. Based on this we can see that in 2011 elections being an incumbent governor typically gives an advantage of 15% when seeking re-election (69.01 – 54.08 = 14.93%). If you’re contesting for an “˜empty’ seat, you’re likely to win by a larger share of the vote (62%) if you’re from the party which was just in power than if you’re from an opposition party (51%). Anyone not in power at the start of the race (whether national opposition or ruling party, whether running against a sitting governor or an empty seat) typically gets a lower margin of victory (47%) than incumbents running for re-election (69%). The advantage of being an incumbent first-term governor running for re-election is not larger for PDP Governors. In fact, non-PDP incumbents won with average 75% share of the votes, whereas PDP incumbents won an average of 68%. It thus seems that being in power locally matters more than being allied with the national ruling party, although more research and larger samples would be needed to prove this. Using the trends in the 2011 elections, if other conditions remain equal, based on the current landscape, we make the following preliminary projections. Seven are in APC-controlled states. If the rule that incumbents win 85% of the time with a 60% share of votes holds, for the 10 states with incumbents running for re-election in the governorship elections, a likely outcome is that the APC wins 6 seats while the PDP wins 4. There are 18 vacant seats which will have no incumbent contesting. In 2011, the PDP won 60% of such seats while opposition parties (although before uniting as the APC) collectively won 40%. Working with this admittedly crude assumption (based on just five vacant seats contested in 2011), the PDP is therefore likely to win 10 governorship states while the APC gets 8 states. This could mean that PDP and allied parties will control 19 states, fewer than the 22 it currently does. However, these are broad generalisations and it is difficult to identify the specific states in question. Going by the initial rule we applied, if the PDP candidate is incumbent President Goodluck Jonathan, he might seem to have an 85% chance of winning with about 60% of the votes. However, given Nigeria’s Federal system, the proportion of vacant governorship seats and the rapidly changing alliances in the political landscape, other variables may come into play. We can assume that states largely support the same party for Presidential elections as they do for Governorship elections (although in 2011 a number of mainly northern states, as well as ACN states in in an electoral pact with PDP in the South-West, bucked the trend). Going by the 85% assumption, if local incumbency is the prime factor, since 22 of the states are currently PDP or allied parties in the current dispensation, the PDP may win the Presidential vote in 21 states (19 PDP states and 2 APC states), and the APC meanwhile would win Presidential votes in 15 states (12 currently APC and 3 PDP states). This is likely to be enough for a simple majority. If however, we go by the projected trends in the governorship elections as useful pointers, we end up with a different result, with both parties winning in 17 states each. The absolute numbers of voters cannot be predicted but it may be significant that the APC goes into the election controlling two states with the largest number of registered voters, Lagos (6.1 million registered voters in 2011) and Kano (5 million). Also remember that section 134 (1) of Nigeria’s 1999 Constitution lays down two conditions for a victory; one is a majority of votes cast, but the other is a minimum of 25% of registered voters in two-thirds of Nigeria’s states (i.e. 24 states). Currently, with support of Labour and APGA, the PDP controls enough states to ensure that. However, in 2011 Bauchi state did not reach the needed minimum even when controlled by PDP, delivering only 16.05% of the vote for the party’s candidate, while Katsina, also PDP, only just scraped over the minimum with 26.1%. So it is reasonable to assume that if support or turnout is low in PDP-ruled northern states, not all may deliver the 25% minimum needed to secure a win for the party’s candidate. In such a circumstance, the Constitution states that candidates would be forced into a second-round run-off election. Such a situation has not previously occurred under Nigeria’s present electoral system. Therefore, of three possible outcomes – outright PDP win, outright APC win, or a run-off election – the most likely outcome based on our projections from current data is that neither party would manage both factors for an outright victory so there would need to be an additional run-off election. Neither is it clear which party that situation would favour. On one hand a nationally incumbent party may retain more resources to continue mobilising, but on the other, both the voting public and important political intermediaries may perceive momentum in the opposition which galvanises support for them popularity. If the presidential election does not favour an outright win for the PDP, it may also further weaken the PDP’s chances at the subsequent gubernatorial level given the proportion of vacant seats (18) to incumbent re-elections (10). The deciding states for the presidential election and the overall fortune of the two parties will be those 18 vacant seats, which also happen to have 54.4% (40.03 million) of 2011’s registered voters, including 10 of the 14 states with the largest number of registered voters, underlining just how open this race really is. Incumbency advantages are very dependent on specific local factors, such as candidates, coalitions, party machinery, electorate sophistication, local issues and more; therefore it is hard to make a solid prediction on the outcomes. Importantly, the 2015 elections appear as if they will be a two-party race in all states, although this may also change if heavyweights who lose primaries in the two major parties decide to leave them. In such a situation, the advantages of incumbency calculated from the 2011 multi-party elections may have less predictive value at the gubernatorial elections because the APC is a merger of three parties with varying strengths; the ACN, CPC and ANPP. This is additionally complex in states (such as Kano, Imo and Kwara) where PDP governors crossed over to the APC. In that case, the advantage of incumbency would go beyond 11% because we would need to consider what proportion of the 2011 vote for other parties in the merger (i.e. CPC and ANPP) will be scooped up by APC. Additionally, in most of the states where the governor crossed over from the national ruling PDP with some or all of his supporters, the PDP still has a solid state structure. While we are able to make some plausible projections where incumbents are re-contesting in 2015, it is difficult to do so for the 18 vacant seats because the parameters so far cannot test the strength of the opposition merger. What we can say however is that these seats will be hotly-contested. Since presidential elections occur before governorship elections, it is possible these projections may have little predictive value on the outcome of the presidential elections because the patterns of voting for the governorship and presidential elections are considerably different. Moreover, there is no clear pattern – beyond an assumed incumbency advantage – by which states vote for a presidential candidate. Several factors come into play such as the interaction of local and national coalitions, incumbency, popularity of presidential candidates, local actors – governorship candidates and power brokers, relative party strength and structure, type of identity allegiances, and historical political behaviour of states. The large number of vacant seats (18 of 28 up for election) will test the cohesion and organisation of the parties. One possibility is that the incentive for an outgoing or “˜lame duck’ Governor in a state with strong presence of an opposition party to “˜deliver’ that state to their presidential candidate is highly variable. Another important qualifier is candidates’ combination and popularity: We cannot fully factor this variable until the APC selects its candidate, but identity considerations are likely to be strong influences. Zainab Usman is a DPhil Candidate at the University of Oxford. Oliver Owen is Junior Research Fellow in International Development at the Oxford Department of International Development. However, remember that five of those Jonathan-supporting states in 2011 were ACN states voting according to a cross-party pact, and this may have dampened voter enthusiasm – despite the pact in Lagos, only 1,281,688 of the 6,108,069 registered voters actually contributed to Jonathan’s win, so we must allow the possibility that greater numbers might turn out for an incumbent party’s own candidate. Five ACN states in the South-West voted PDP in the presidential elections while nine PDP states voted CPC in the presidential elections in 2011. Resolving the Ethiopia-Eritrea border: What actually needs to be done? Adamawa, Nasarawa,Imo,Edo and all the south western states. Also it’s should be noted that the candidancy of GEJ has lost the voters confidance in the south west states. Also state with the highest registered voters are opposition states. Finally, campaign fund ll not be the problem of the APC candidate as it was in 2011 and the underground side of politics politicians do to win elections are present in both PDP AND APC. This include election rigging, and all sort of desperate act that was not the case in the CPC to win elections in 2011. It must also be noted that my submission has to do with the candidancy of Buhari as CPC candidate and also if he emerges APC candidate. I thoroughly enjoyed reading this – and I think I largely agreed with the predictions. One point however, I am not very comfortable with is the part where the writers claimed the incumbent President won in 2011 due to an “electoral pact between the PDP and the now-defunct ACN which ran most South-Western states.” How certain are you about this statement? Is there any evidence to support this or is it just an attempt to easily rationalize/explain the victory of the PDP in an ACN-controlled Southwest hitherto thought to be impenetrable to the PDP? What if this were not the case, would it in any way affect your predictions or compel you to attempt to find rational explanations for why the PDP won in an ACN stronghold? I think your analysis has strongly whittle down the power of incumbency in Nigerian politics. you need to live up to these realities. secondly, I wouldn’t rule out some elements of bias in your assessment or you might be slightly out of touch with the masses. Your assessment might really take into consideration social media opinions of young, and educated intellects who don’t most times vote on elections but choose to stay away. the real voters are the market women, village groups and people who don’t have access to or can’t use the social circles to voice out their opinions. I must commend both of you for this lengthy analysis and projections. While I will cage my thought most especially on the projection of re-run election.I must raise a red flag that another June 12 is imminent. This analysis is detailed but as you rightly observed, a few of the assumptions may radically alter the projections. Nigerians are more divided along religious and ethnic lines today than they were 4 years ago. In spite of incumbency factor in states like Rivers and Edo, it’s difficult to imagine the APC candidate winning there just as the PDP candidate is not likely to sweep the polls in Kano and maybe Kaduna even though Jonathan’s running mate comes from the latter. Secondly, the APC appear to have lost momentum in the south west as evident in the Ondo and Ekiti elections. If Buhari emerges the APC presidential candidate as he is most likely to, the choice of a running mate will be crucial. This I believe is APC ‘s main hurdle. Can an Amaechi deliver Rivers state or the South -South to the APC ; can Rochas deliver the South -East to APC or Nigerian Christians back a Buhari-Fashola ticket being Muslim-muslim or still will Yorubas vote massively for a ticket without one of their own.? The political cloud in Nigeria grows thick every day and the rains drop as such may be a widespread to culminate everyone into all aspects been it good or the other side. My opinion remains lets people have what they wish and like as to matter of election without infringement of any kind from who’s so ever. All other issues like insecurity, political oppositions and social vices that’s tempting the nation’s polity should be treated independent of people’s rights and choices on election result and processess. If this can be done which is very possible, Nigeria would be safe for all and INEC has more than tideous work to do. I totally agree with the analysis of a likely run-off, but PDP will fight to win at first ballot so that they could hold on to power. Going for a run-off will not favour PDP.